Do you suffer from back and leg pain? 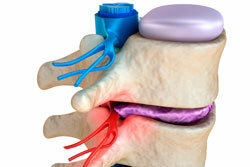 Do you have sciatica or a prolapsed disc? Are you frustrated that you still haven’t recovered? Are you fed up with taking lots of medication? Empower Rehab provide a comprehensive physiotherapy assessment to ensure all factors preventing your recovery are addressed. We will help you to return to all facets of your life including socialising with friends, returning to your leisure activities, and keeping on top of your house and work commitments. If you have had sciatica for greater than three months, an integrated treatment approach may be recommended to provide even further benefit to you.